Architecturally designed homes with brick, stone, precast and stucco construction. 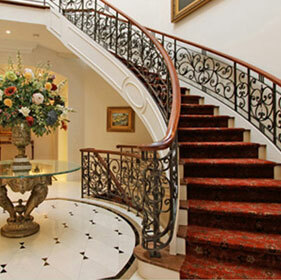 Details such as decorative metal railings, precast surrounds and keystones as per elevation. Concrete front porches and precast steps, as per plan. Architecturally selected and controlled exterior colour packages. Wood and steel beam construction, as per plan. 2 x 6 exterior wall construction. Engineered floor joists, sub-floor sheating to be nailed, glued, sanded and screwed. 5/8” tongue and groove plywood sub-floors. Self-sealing, high-grade fiberglass shingles with 30-year manufacturer’s warranty. Poured concrete basement walls (approximately 9’ high) with heavy-duty damp proofing and weeping tiles. Basement “wrap” water proofing system to be installed on foundation wall (excluding garage) to prevent water penetration into basement. Insulation in full conformity as per code for conservation of energy. Cold storage room in basement, as per plan. Rough-in 3-piece bathroom in basement, as per plan. Black finishes metal exterior lights on front elevation and rear. Brushed nickel finish grip set(s) and deadbolt on front door. Custom address stone on front elevation. Two freeze resistant exterior hose bibs, one in garage and one at rear of house. Patio slab walkway from driveway to front entry door. Pre-finished Premium molded sectional overhead garage doors with glass inserts. Landscape package consisting of sodded front and side yards, and rear yard seeded. Waterproof electrical outlets at rear of house, and one at front porch. Colour coordinated vinyl thermo pane Low E argon casement windows with muntins throughout. 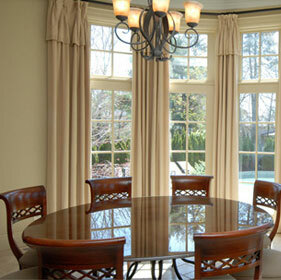 Basement windows are casement or vinyl thermo pane sliders, as per elevation or grade. Some decorative windows are fixed glass, as per elevation. All operable windows to have screens (one operable window per room). All doors and windows sealed with quality exterior caulking. Elegant oversized fiberglass insulated front entry door with matching sidelight(s) and/or glass door inserts, as per elevation. Insulated metal door from garage into house, rear yard or side yard with self-closing device, as per plan and as grade permits. (Garage to interior door to house, if applicable, may be lowered, relocated or eliminated to accommodate drainage as per grading, siting or municipality requirements, if applicable). Garden door or French door to rear yard, as per plan. 200 AMP automatic circuit breakers with heavy duty copper wiring. PVC pipes for water supply lines. Shut off valves for all sinks and toilets. Electrical receptacle and recessed hot/cold water connections provided for washer. Vent sleeve and cover for laundry dryer. Heat Recovery Ventilation, High Energy Efficiency forced-air direct vented gas furnace(s). Central air conditioning unit(s), as per plan. Ceiling outlets in foyer, hallways, laundry, mudroom, kitchen, breakfast room, morning room, study, library, solarium, family room, great room, guest room and all bedrooms with Builder supplied fixtures, as per plan. Capped ceiling outlet in dining room for future light fixture. White Decora-style light switches, receptacles and plates. Rough-in for television cable in all bedrooms, guest room, family room, great room, study and library, as per plan. Rough-in for telephone outlet provided in all bedrooms, guest room, kitchen, family room, great room, study and library, as per plan. Rough-in Cat 5 wiring provided in all bedrooms, guest room, kitchen, study, and library, as per plan. Electrical door chime at front entry. Smoke detectors on all levels, as per code. Carbon monoxide detector provided as per code. High efficiency Hot water heater on rental basis as per lease schedule. Rough-in central vacuum outlets in all finished areas, as per plan. Duplex outlet on garage ceiling for every overhead garage door. Complete septic system as per engineer and Town approval. Ten-foot (10’) high ceilings on main floor (except in powder room and/or laundry room and where architectural design, mechanical or duct work requires ceiling height to be lowered). Nine-foot (9’) high ceilings on second floor (except in laundry room and where architectural design, mechanical or duct work requires ceiling height to be lowered. One paint colour throughout from builder's samples. Interior wood trim and doors to be painted semi-gloss white. Direct vent natural gas fireplace(s) with cast stone mantel and hearth, from Builder’s standard samples. Smooth ceilings throughout main and second floors. Stained oak stairs in all finished areas with oak nosing, stringer, upgraded railings, decorative wrought iron pickets, as per plan. Treads are oak with oak veneer stringer and risers. Stair landing to be stained strip hardwood. Vaulted, tray, coffered, domed or cathedral ceilings, as per plan. Satin nickel finish, straight-style door levers on all interior passage doors. Trimmed archways on main floor, not including curved archways. Smooth 2-panel solid core passage doors; 8 ft. on main floor, 7 ft. on 2nd floor. 7 1/4” baseboards and 3 1/2” backbend casing throughout finished areas. Square smooth wood columns, as per plan. 20 interior pot lights on main floor only, at locations of your choice. Garage walls and ceiling to be fully boarded and primed only. 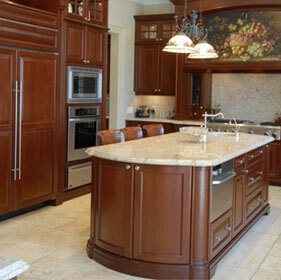 Upgraded kitchen cabinetry including traditional and contemporary options. Dummy doors on front of islands, as per plan. Recycle bin cabinet, as per plan. Servery with base cabinet and granite countertop, as per plan. Walk-in or built-in pantries, serveries, breakfast bars and kitchen islands, as per plan. Level 1 granite countertops, from Builder’s standard samples. Double compartment stainless steel under mount sinks. Single lever contemporary faucet with integrated pull-out spray. Kitchen backsplash, from Builder’s standards. 36” Stainless steel chimney hood fan. Dishwasher rough-in includes electrical and plumbing only with space for dishwasher. Hook-up cost is extra. Cabinet and door not included. 18”x 18” or 12”x 24” matte porcelain or ceramic floor tiles, as per plan. 4 3/8”x3/4” Hardwood strip flooring, as per plan. Comfort height vanity cabinets with bank of drawers. Marble countertops including make-up counters, as per plan. Double sink vanity, as per plan. Free-standing deep soaker tub with mounted faucet, as per plan. 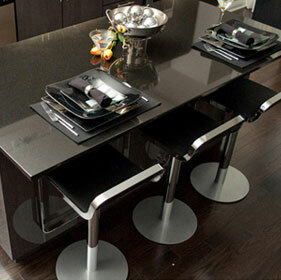 18”x 18” or 12”x 24” polished porcelain floor tiles. Walls tiled with 18”x 18” or 12”x24” Polished Porcelain tiles, not including ceiling. Frameless glass shower enclosure with door, marble jamb, waterproof interior pot light. Comfort height vanity cabinets with separate bottom drawer. 12”x 12” or 13”x 13” ceramic or porcelain floor and wall tile. Frameless glass shower enclosure with door, marble jamb, waterproof interior pot light, as per plan. All bathrooms without separate shower stall to have acrylic soaker tub with 12”x 12” or 13”x13” ceramic or porcelain wall tile enclosure, not including ceiling. 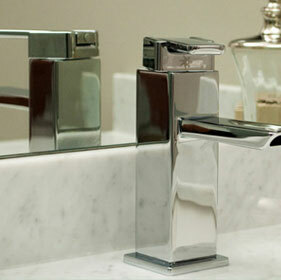 Single lever chrome faucet in all vanities with built-in balance regulators. Pressure balance valve in all bath and shower enclosures. Low flow showerheads in all showers. One piece, elongated, right height, water conserving toilets. Quality white bathroom fixtures including sink, tub and toilet. Waterproof interior pot light in shower stall. Pop-up drains in all bathroom sinks and tubs. Choose from contemporary and traditional upgraded bathroom vanity cabinetry. Oversize laundry or mudroom, as per plan. White laundry lower cabinet with melamine countertop, as per plan. Drop in sink for lower cabinet. Single lever, high arc chrome faucet for single basin laundry tub, as per plan. 18”x 18” or 12”x 24” matte ceramic or porcelain floor tiles. Defects in workmanship and materials for one year. Defects in workmanship and materials for 2 years on electrical, plumbing and heating distribution systems. Any water penetration through exterior cladding, windows, doors and exterior caulking. Major structural defects 7 years. Refer to Tarion Construction Performance Guidelines for further details. All references to features and finishes are as per applicable plan or elevation and each item may not be applicable to every home. Purchaser’s choice of interior colours and materials from Vendor’s standard samples if not yet ordered, installed or completed, provided that colour and materials are available from supplier. Purchaser agrees to select the colour and materials according to the Vendor’s schedule, otherwise the Vendor reserves the right to choose the colour and materials to complete the dwelling and the Purchaser agrees to close the transaction with the Vendor’s choice of colour and materials. Variations from Vendor’s samples will occur in materials and finishes due to normal Production processes. Granite, marble, hardwood, countertops, cabinets and flooring are natural materials with variations, gradations, veining and graining always found in natural materials. Laundry room floors, where applicable, may be lowered to accommodate entry door(s) due to grade at the Vendor’s discretion (unfinished basement ceiling height shall be lowered accordingly). All plans and specifications are subject to modification from time to time at the sole discretion of the Vendor. The Vendor reserves the right to change the foregoing specifications without notice. Purchasers are notified that the number of steps to front entrance and rear entrance may be increased or decreased depending on final grading. The Purchaser acknowledges that finishing materials contained in any model home, sales office display or digital presentation, including broadloom, furniture, mirrors, electrical fixtures, drapery and window coverings, tile flooring, hardwood flooring, marble flooring, upgraded cabinetry, countertops, stained staircase and railing, painting, wall paper, etc. may be for display purposes only and may not be of the same grade or type, or may not necessarily be included in the dwelling unit being purchased. Room dimensions, door and window configurations may vary with final construction drawings. All ceiling heights are approximate and may vary. Some ceiling heights will be dropped to accommodate HVAC, plumbing, venting, electrical, mechanical, insulation, bulkheads and other structural requirements, which will result in areas of lower ceilings heights. Prices, terms and conditions subject to change without notice. The Vendor has the right to substitute materials of equal or better quality. E.&O.E.